This entry was tagged outreach, promotion, R1 vs non-R1, reputation, social media, tenure. With a bit of CV forensics, you can infer a lot about the career of an academic. One potential indicator of tenure denial is employment as an Assistant Professor for seven years, not immediately followed by an Associate Professorship. An astute person mulling over my CV would notice this. I don’t hide this fact, but I don’t advertise it either. It’s no secret, by any means. Volunteering this fact comes with some serious baggage. It’s not like I was denied at Harvard, where denial is the default expectation. In my last job, tenure denial was a rarity. You had to really botch it to get denied. While I had some high-performing colleagues, I also had one colleague who was tenured despite not publishing anything after getting hired. Others moved successfully through the system even though they were notably ineffective in the classroom. Even though the bar was low, I didn’t make it over. The standard of line of thought must be that I really sucked at my job, or I must have been a major jerk. It’s difficult to argue against that reasoning. Tenure denial is a failure. Tenure denial can be caused by poor professional performance, poor navigation of politics, or by personal faults. I would bet that, if any of you called up my former colleagues who were involved in the process, that their explanation might be evenly split among the three possible causes, and maybe a trifecta of all three. The experience of tenure denial is extraordinarily difficult. It’s painful and lonely. There is a mixture of grief and loss, often heavily salted with injustice. Take the angst involved in the path towards a tenure-track position, and mix in six more years of effort. Then, top that with your spouse’s career and bake in your personal finances. It’s hard to describe, and I wouldn’t wish it on anybody. These articles were published pseudonymously. Obviously, at the time it would have been unwise to discuss my job search process in real time under my real name, especially in my delicate position. (The only fact that I altered in the columns was that I switched the gender of a couple individuals.) Because I didn’t use my own name, the reach of those articles might have been limited. If I want to make a bigger difference by having written these articles, then connecting my real name to them might create a better understanding because I don’t have to obscure any details about myself. I am, admittedly, more fond of my current job than my last one. I don’t think this difference is caused by my nasty experience, but could reflect that I am genuinely a better fit for my current job. The sources of great pleasure in my current job were scarce in my old job, and the things that I dislike about my current job were in far greater supply at my old job. So, have at it. If you wish to leave comments about this story, I do recommend that you read the five columns to which I have linked. This entry was tagged applying for jobs, careers, tenure. This week I’ve been a bit distracted by instructions I’ve been given for a demonstration teaching lecture. It is for a permanent position in my department so the interview is stressful, important, and far from certain. There are three others interviewing for the spot, all colleagues and/or collaborators*, all friends, and all deserving of the position. It is also a little strange in that you can exactly know the CV of your fellow candidates and that all of us will show up for work after the interview, regardless of the result of the job search. The only difference is that one of us will have a permanent job and the others will not (still). I have talked a bit about the Swedish interview process previously and the upcoming one will function in a similar way. One major difference is that in addition to a short research lecture, we’ve been asked to give a 20 min teaching lecture. The topic is outside everyone’s expertise (Ecology of Plant-Pathogen Interactions), so in some senses an even playing field. I have taught classes previously but not on this particular topic. But given that I’ve never done a demonstration lecture, I’ve been thinking a lot about how to tackle the task. 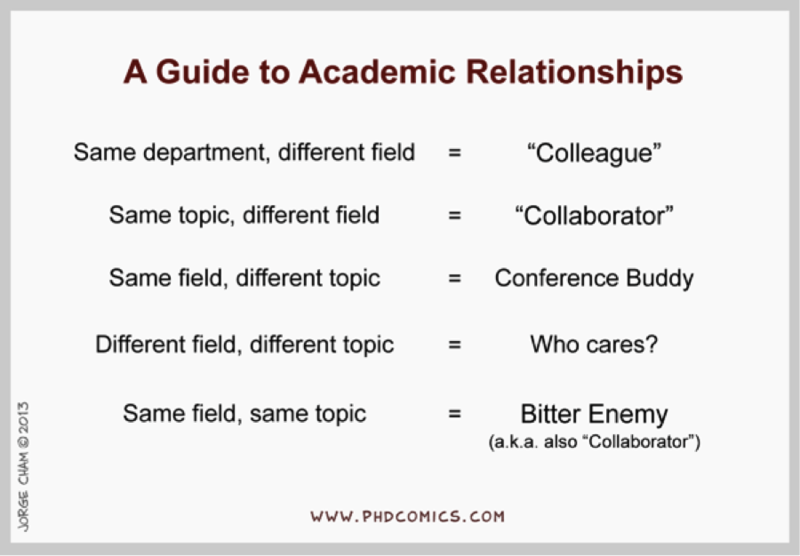 Unfortunately, teaching talks don’t seem to be a common feature of the interview process, so unlike the research seminars and chalk talks, there isn’t so much out there (see Meg Duffy’s post on links for tenure-track job searches, for example). Teaching talks: Many places will have you give a teaching talk—they may give you a topic or let you choose one from a list. Some will want a sample lecture—others may actually want a verbal statement of your teaching philosophy. In general, ask those around you that actually teach those subjects for outlines or notes. It is usually fine to have notes for your teaching talk. They will probably ask you to not use slides, but overheads and handouts may be very useful. The faculty may interrupt you during your talk and pretend to be students asking questions. Try not to get flustered by them, but rather have fun with them. Even before reading this, I began my canvasing of people for lectures on plant-pathogen interactions. So far I haven’t found it to be a common topic in ecology courses (if you lecture on the topic and are willing to share, yes please!). So after researching for this interview, I might also advocate for including the lecture in one of our ecology courses (I have funding for two more years regardless of the outcome of the interview). I’ve only had one experience with this sort of interview requirement and that was indirect. When I was a masters student, my department was hiring a number of people to expand and we were also going to an Integrative Biology model from an organismal division (merging depts). So there were a lot of positions (~6) and likely a lot of opinions on how to best fill them from colleagues who hadn’t worked together before. In any event, I got to witness a bunch of job talks and meet with a lot of candidates. It was a useful lesson as a grad student but the one portion that was closed was the test lectures. I’m guessing these were to distinguish people’s ability from very different fields but I don’t know what the exact instructions were. We (the grad students) did hear rumours that some people’s talks were terrible, so it clearly doesn’t do to blow teaching talks off. But how to do it well? Turning to advice on how to give lectures can give some clues. Improving lecturing has a bunch of hints and tips for generally improving your lectures. Another list of practical pointers for good lectures is focused mainly on the classroom but can also be helpful in thinking about how to demonstrate your teaching. I had to link this good talk advice for the hilarious nostalgia it created for the overhead strip tease (advice: don’t do it, and I think this also applies to powerpoint reveals). My plan is to demonstrate how I would give a lecture to a course, including emphasizing where I would stop lecturing and turn things over to the students. As I move away from straight lecturing, it feels a little strange to demonstrate my teaching through lecturing only. But I only have 5 minutes to describe the structure of the course, where this lecture would fit in and how I would evaluate learning, followed by the first 15 minutes of the lecture. Given all that is required to pack into 20 mins, this teaching talk is really a demonstration, rather than a lecture. I won’t prepare for it as I would do for a regular course lecture and given my unfamiliarity with the topic, it is also going to take a fair amount of research. This is a job interview, so I know it isn’t really a teaching lecture, it is a performance. One I’m hoping will convince the committee to let me get on with actual teaching for years to come. I’d love to hear from anyone who’s done a teaching lecture as a part of their interview! Advice on how to nail this will be greatly appreciated by me but I’m sure others on the TT job search will also appreciate pointers. This entry was tagged communication, efficient teaching, interviews, job searches, teaching, tenure, undergraduates. My job, as a tenured associate professor of biology, wouldn’t be possible without a sizable crew of adjunct instructors in my department. Here is some context about the role of adjuncts in my particular department: At the moment, the ratio of undergraduate majors to tenure-line faculty is about 100:1. This isn’t unprecedented, but is on the higher end of laboratory science departments in public universities. Because we have so few tenure-line faculty, and so many lectures and labs to teach, we hire a slew of adjuncts every semester. It’s not like the adjuncts are there to make life easier for tenure-line faculty. They’re here to keep the department from falling apart and to teach classes that otherwise we would be unable to teach. One thing that keeps us tenure-line faculty busy is advising. All of our majors required to be advised every semester in half-hour appointments, one-on-one with tenure-line faculty, in order to be able to register for the subsequent semester. In addition to our base teaching assignment of four lecture courses per semester and the standard research and service expectations, we’re worked mighty heavily. Lest I complain, I am thankful on a daily basis that I am paid a living wage, if below market rate, and I am in a union that has mostly held on to benefits like our parents fathers used to expect from their employers. That’s more than our many adjuncts can say. If it were not for a stroke of tremendous fortune in a very difficult time, I would not be able to be in this position. While I do have some additional responsibilities that are not expected of our adjuncts, this disparity between job expectations is tiny compared to the massive disparity between our relative pay, benefits and job security. While I would hope to think that the things I offer on top of my teaching (research opportunities and individualized mentorship for a small number of students, external grants to bring money and reputation to the institution, and a meaty role in institutional governance) bring value, I cannot reasonably rationalize that those services justify the massive gap between the my compensation and that of my adjunct colleagues. I also am conscious that many tenure-line faculty in my university do little to nothing more than some of the adjuncts, skipping out on faculty governance, making themselves unavailable to students outside class, and not providing research opportunities. These faculty are more like adjuncts with a full professor’s paycheck and pension. What’s worse is that I could choose to devolve into such a role with no consequences for my pay, benefits or security of employment. I have particularly benefited from the contributions of adjunct labor. In my current university, I actually have never taught the full base teaching load, as I’ve always had some fraction of my time reassigned to additional research, administration, outreach or professional development activities. (And, to be clear, I spend more time on the jobs to which I am reassigned than is expected of me while teaching.) The only way that I have been able to carve out time to keep my research lab ticking, write grants and run some programs is because others have stepped in to get the work done. These people are as qualified as I am to teach these courses, have plenty of teaching experience, and are getting paid less than I would if I were to teach those courses. Hiring an adjunct instructor as a one-off to cover a course that needs to be covered isn’t necessarily exploitation. But if this temporary labor pool is not truly temporary, and if these are not one-off arrangements but instead a machine that requires the dedicated effort of many contingent workers on a long term basis, this is overtly exploitative of the contingent labor pool. It is wrong that my department has several people who teach lots of courses for us, year after year, and aren’t able to receive an appointment as a professional ‘lecturer’ that acknowledges their professionalism and compensates them as one would expect from an employer after providing years of service. It’s not criminal, but in some countries, it might be. When I graduated from a mighty-fine private liberal arts college twenty years ago, the catalog had the name of a tenure-track professor next to every course. I had taken two courses with adjuncts the whole time I was there (one of which was taught by a senior and established person in the field who did for it fun and for the students). Now, students on this campus take many courses with adjunct instructors, the campus catalog no longer has the professor’s names tied to courses, and there is a large and growing pool of adjuncts clamoring for equitable treatment. This isn’t a sign of the decline of this institution, but instead an indicator of the adjunctification of higher education. Like the house elves in the Harry Potter series, an army of highly-qualified and hard-toiling adjuncts make the magic happen in a university, without recognition or reward. Faculty members on the tenure-line are not ignorant of this massive injustice that empowers their existence, but mostly feel powerless to rectify the systemic situation. Universities have created a caste system, and how is it that individual members of one caste can create an equitable labor arrangement? 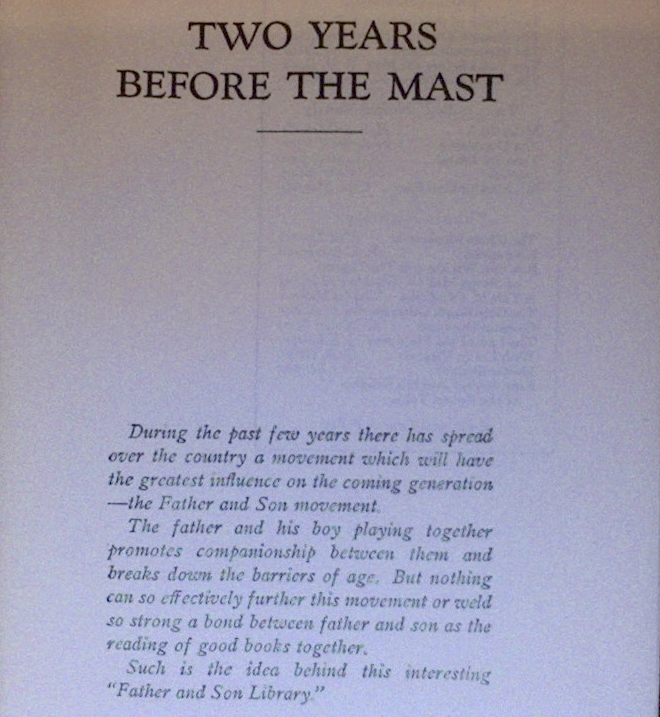 Short of a quixotic revolution, what is there to do? We can agitate for change. We can decry the situation. We can write blog posts, articles and books about the exploitation of adjuncts as working-class academics. That’s part of moving towards change, I guess. However, I feel that this isn’t enough considering that I am a member of the caste that benefits from the labor of the adjunct caste. I’m not saying that I don’t deserve the compensation that I receive, but it is abundantly clear that long-term adjuncts don’t deserve the lack of compensation that they receive. I just don’t see any particular course of action that I can do within the context of my own job. I can, and do, treat adjuncts as full colleagues, and I can join the others in our union to advocate for adjunct rights. I do not have the power to make right any systemic wrongs, and neither does my Chair, nor my Dean. I suppose the power is within the Provost’s office to make these changes but the budget isn’t there. The entire university system has been calibrated to cut costs on the backs of adjuncts. If tenure-line faculty members are failing to press hard for the reasonable and fair employment of the adjunct labor pool, then it’s probably not because they aren’t aware or because they don’t care. It’s the same reason that they don’t take specific action in their lives to reduce their own carbon emissions, and it’s the same reason they don’t buy all of their clothes that are certified sweatshop-free, and the same reason why they don’t buy books from independent booksellers. The problem is so big and so systemic, that it’s overwhelming. Individuals have trouble remembering that individual actions, at the right place and the right time, make change happen. The university is not making things easier for tenure-line faculty either, who need to take up a greater share of the non-teaching work as tenure-line positions fizzle away. I want to rage for adjunct rights, and it makes me upset, and I want to do something. So I wrote a blog post, but I can’t imagine that this will change anything. So, what else should tenure-line faculty do? Update 27 Sep 2013: The non-rhetorical answer to the rhetorical question above was provided by Jenny in the comments, who shared this story about specific and concrete efforts at Portland State University written by Jennifer Ruth. That is, apparently, what we should do. This entry was tagged adjunct, adjunct faculty, fairness, reassigned time, resources, teaching, tenure, union. What determines your success? How famous you are. Most famous scientists have a history of excellent research with high impact. And most researchers with a history of excellent research with high impact are famous. (Fame, that is, among scientists.) However, the r2 on this relationship is well below 1. What explains the variance? 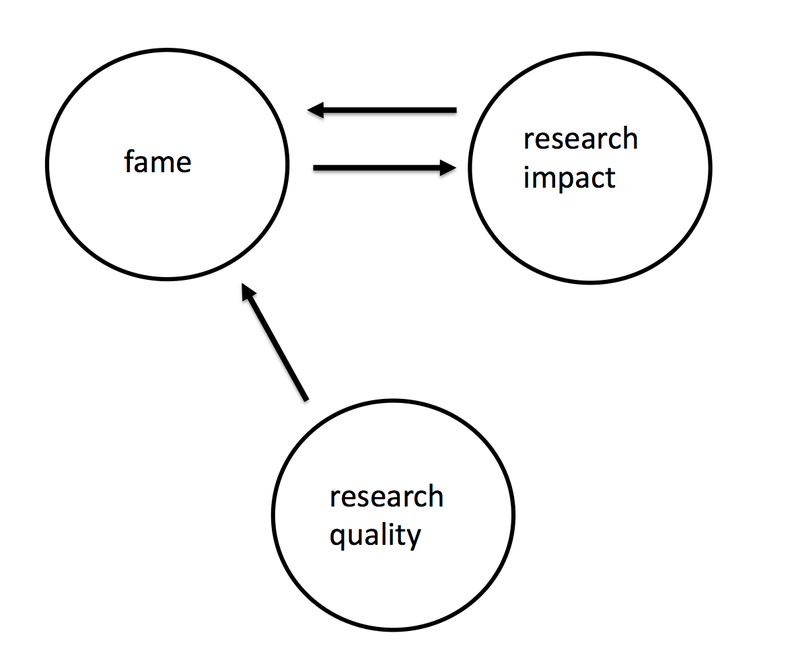 What are the factors that makes you more famous, or less famous, than would be merited by your research quality? Is the impact of your research — how much it influences the work others — closely tied to your fame or are there people who have a high impact but not well recognized – or people who are quite famous but don’t have much impact? I posit the figure above only as a suggestion, a working hypothesis that I’m not wholly wedded to. It’s a good template for discussion. The ceiling of the impact of your research is dictated by how famous you are. Your impact could be (very) crudely measured using impact factor, or by an h-score or some other measure of citations. How much of a difference you make. You might get cited a few times if nobody has heard of you, but essentially you need to be known for your work to make a splash. You can only make a difference if people know who you are, which is exactly the point that Dr. Becca made. Your job, if it is to make scientific progress, is to become famous. Because you can only make a difference if you’re famous. If asked to name two huge advances in biology from mid-1800s, most of us would pick the same things. One came from a person working in obscurity and another by one who was, among scientists of the day, mighty famous and was in regular communication with other famous scientists. Darwin’s scientific impact was immediate. Mendel’s finding required the fame of Hugo de Vries to create a scientific impact more than thirty years later. There are many things that contribute to fame. One of these is research quality, but also the institution you came from, your academic pedigree, attractiveness, personality, and also your ethnicity and gender can have an effect. What’s another thing plays a key role in facilitating, or limiting, your fame? The institution where you work. If you’re not based out of a research institution, there is a hard cap on how famous that you’re allowed to become as a research scientist. However, if you’re at a teaching institution, the school doesn’t really want you to be a research scientist of any fame, anyway. Fame isn’t part of the evaluation process for tenure, and you could be entirely unknown off campus and this shouldn’t (necessarily) negatively reflect your tenure bid. This would be fatal at a research institution, where you’re expected to establish a visible profile in the research community. Our jobs at teaching campuses do not expect us to be famous and do not require it. This might be a defining contrast between a teaching campus and a research campus. However, there are lots of us in teaching institutions that not only are doing consequential research, but also want this research to have as much impact as it possibly can. However, based on the name of the institution found on our nametag when we present at conferences, this becomes very difficult. There’s a positive feedback loop connecting one’s pedigree, social network, publication history, favorable reviews of grants and proposals, funding, talent of collaborators and fame. They’re all connected to one another. And if you’re at a teaching campus, you’re at a strategic disadvantage because those positive feedback loops don’t work as tightly. Leveraging your pedigree, papers, and collaborations is harder to do, because of unacknowledged biases against teaching campuses in the research community. You can’t be famous above a certain level, because those at research institutions assume that you aren’t working at one because you can’t get a job at one. If you’re doing research from a teaching institution, that means that you haven’t had enough success to work at a teaching institution. So the thinking goes. Even in the incredibly tight job market, that line of thinking still prevails. You’re skeptical? Pull up a few journals and look at the mastheads, to find the institutions of the editorial board members and the subject editors. So, unlike Dr. Becca and those at research institutions, my job isn’t to become famous. Even if I was famous, nobody on campus would even be aware of it anyway. However, if I have ambitions for my research to make a difference, then I need to become famous. This fame is required to activate the positive feedbacks among friendly reviews, funding, invitations, collaborations, and so on. This entry was tagged publication, R1 vs non-R1, reputation, tenure.